2 OZ. 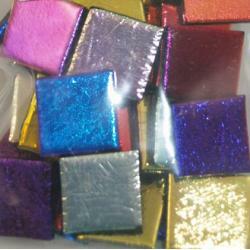 OF DICHROIC MOSAIC TILES. 96 COE. ASSORTED COLORS ON BLACK GLASS TILES. SIZE: 3/4" TILES WITH 1/8" THICKNESS THE SAME AS OTHER TILES. EASILY CUTS WITH WHEELED NIPPERS. APPROXIMATELY 20 TILES PER 2 OZ. USE AS ACCENT PIECES OR DESIGN YOUR WHOLE MOSAIC WITH THESE BEAUTIFUL IRIDESCENT TILES WHICH CHANGE COLORS DEPENDING ON THE LIGHT. CAN BE USED IN OUTSIDE PROJECTS. ONLY USE DISTILLED WATER WITH THESE TILES.